Transport Infrastructure Ireland (TII) has decided to omit the already identified Thurles Bypass from their recent forecast of necessary works, soon to be undertaken nationally. So, if I were Mr Garret Ahearn, Fine Gael’s proposed election candidate, and hopeful heir to Co. Tipperary; I would now be planning on drastically reducing my General Election posters in the environs of Thurles, come the next general election: latter election which punters expect shortly. In this same useless and tedious printed material, Mr Ahearn quotes An Taoiseach, Mr Leo Varadkar as stating, “When people speak to Garret (Ahearn), they are effectively speaking to the Government”. Ok, Mr Ahearn, so, what is the message you received from the Fine Gael government on this same Thurles issue, or are you, Sir, simply reflecting the words from that dystopian novel published in 1949, by the English author George Orwell, titled “Nineteen Eighty Four”, set in the year 1984. Quote: – “The Party seeks power entirely for its own sake. We are not interested in the good of others; we are interested solely in power, pure power. We have observed your motor vehicle from time to time, in our midst, covered in promotional material urging us to grant you substantial salary; expenses, and a State pension, but have you taken the time to witnessed the chaos caused by heavy goods vehicle traffic, attempting to manoeuvre around Liberty Square from narrow side streets. You will surely be aware of frequent collisions and sadly some tragedies caused by this congestion over the last 10 and more years. Same heavy goods vehicle traffic arrives from North, South, East and West; forced to converge upon Thurles town centre in an effort to supply the very few remaining particles of local industry, same left behind to remind us of this present governments negligence of not just Thurles, but rural Ireland as a whole. (1) Funding for new emergency Diversion Routes & Symbol Signage are being prepared for that C-shaped orbital Dublin motorway, best known as the M50. (2) Minister Mr Shane Ross; Galway Co. Council, and Transport Infrastructure Ireland (TII) have, this month, approved the advancement of the Galway City Ring Road Scheme. Galway Co. Council have now been invited to submit their Environmental Impact Assessment Report; Natura Impact Statement; Motorway Scheme Order, and Protected Road Scheme Order for this scheme, to An Bord Pleanála, which will also provide an additional bridge to cross the River Corrib, thus improving connectivity with the west of the city and into Connemara. The silence here in Thurles remains deafening. 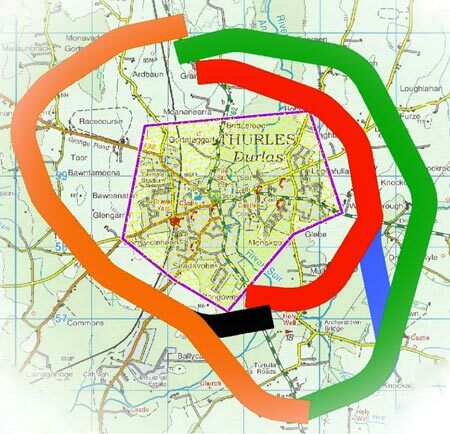 What has Thurles gotten in the last 10 years or Templemore or Roscrea….. This part of Tipperary has been forgotten about completely. I have sent an e-mail to Mr. Ahearne on 4th August, 2018, a reminder on 4th September, 2018 and a further reminder today asking him to expand on his statement ‘A new era in Tipperary…working for Thurles’. To date I have not received the courtesy of a reply. George, your sentiments are 100% correct….all talk and no action.